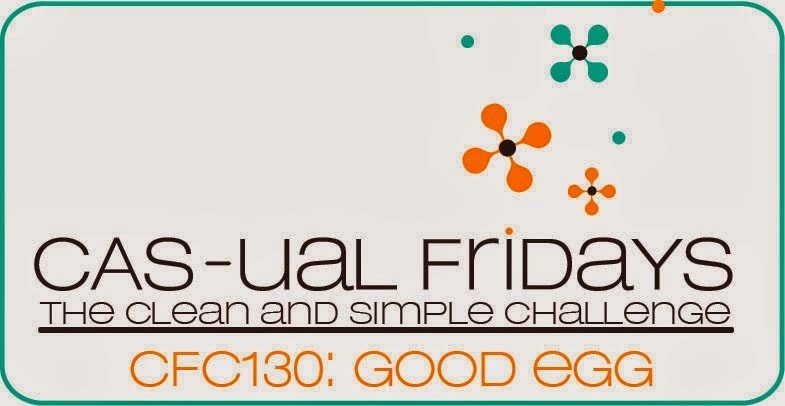 The spring challenge at CAS-UAL Fridays is called the Good Egg and we are to create a Clean And Simple project using....OVALS! After much thought I decided to create a simple spring flower using 6 ovals cut from Yellow CS with the smallest Nesties oval die and 1 circle of Orange CS cut with Nesties circle die. I shaped the "petals" with a flower shaping tool and dry embossed the orange center with Cuttlebug EF Swiss Dots. Using my Scor Pal, I scored 2 vertical lines in the center of my Card Base of white CS for the stem and colored with Memento Bamboo Leaves Ink . I also scored 2 vertical lines on each side of the card front but the photo does not show them very well. I stamped the sentiment from Flourishes with SU Always Artichoke ink. I assembled the flower with Scor -Tape and adhered to the CAS card. Hello! Welcome to my blog. Join me for a cup of coffee. 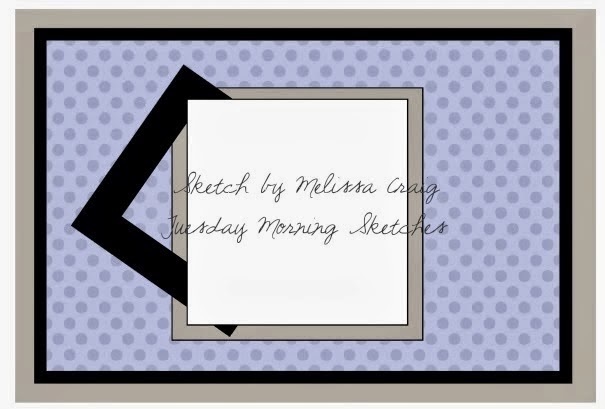 My card today is made with a sketch from Tuesday Morning Sketches and is for a color challenge using Brown and Red. 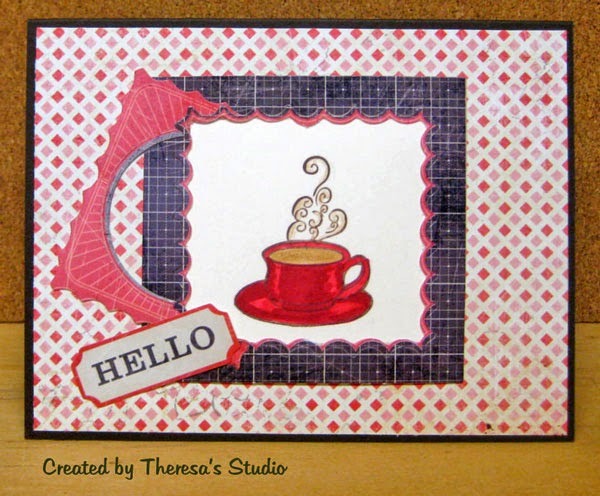 I used a coffee stamp as the focus on layered pattern papers with cutouts and a sticker sentiment. Welcome! 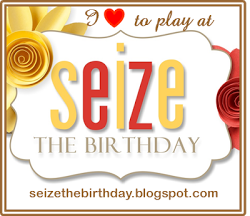 I am having so much fun playing and exploring with the Silhouette Cameo. For this card, I used a Silhouette Print and Cut File design that I printed and then cut out all with the Cameo....yes, you print a file from the machine on your printer and then insert the image into the Cameo and it knows exactly where to trim if you follow the simple directions. The image was a bit large (this could have been resized smaller) but I decided to use it anyway on a white lattice cut out of glossy white CS with Cheery Lynn die and attached to a card base of pink CS.The ribbon was thread through punched holes on the image and tied into a bow before attaching. I stamped the Hero Arts sentiment with SU Regal Rose ink on White CS and fussy cut and attached with pop up dots. 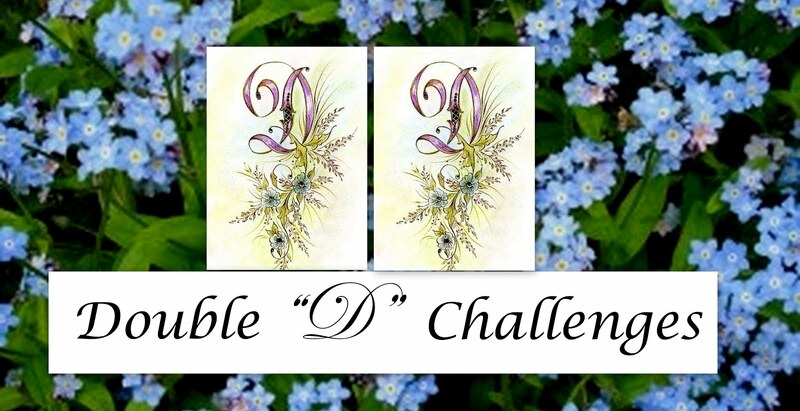 Joan's Touch: This card fit all the requirements for her challenge #6 this week. Use lattice, Pink and White, Flowers and a Product ( Cheery Lynn Die) sold at Joan's Gardens. Also bought the Pink CS at Joan's Gardens but not available now. 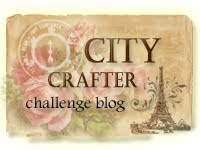 A few weeks ago, I won the DIY Shop Collection by Crate Paper. 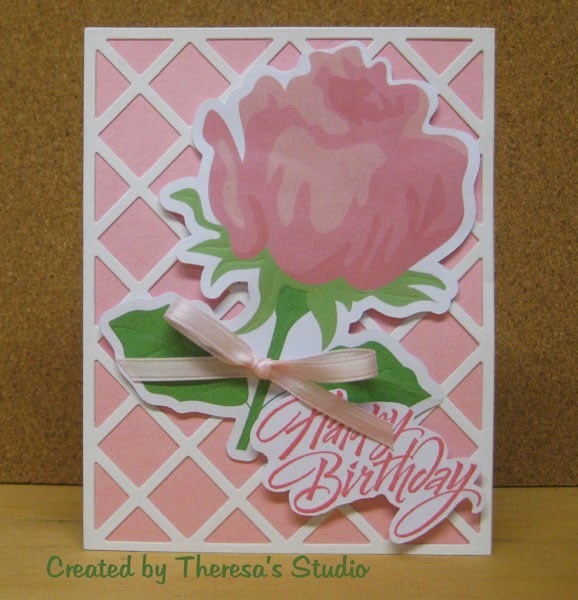 It is so easy to create cards using the great papers, diecuts, stickers and other embellies from this collection. 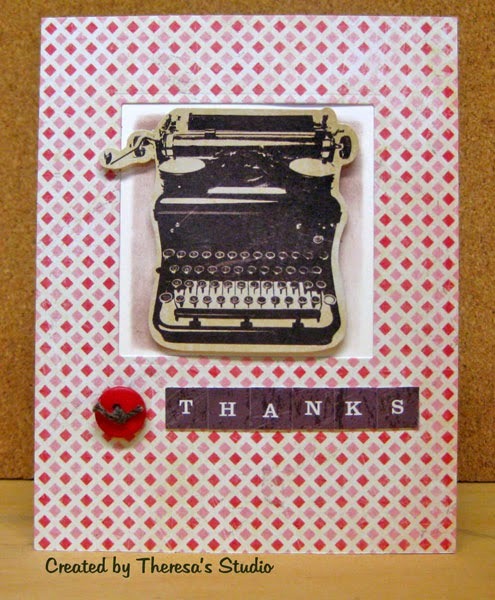 Today I have a card made with a die cut of a Vintage typewriter paired with letter stickers and pattern paper. Added a button with twine from my stash to finish. Cut a window from the pattern paper with a square Nestie and popped up the cut out in the center on an inset of ivory cs with pop up foam. I used a sketch from CAS(E) this Sketch for my layout. I am always looking for something different to try on a card. 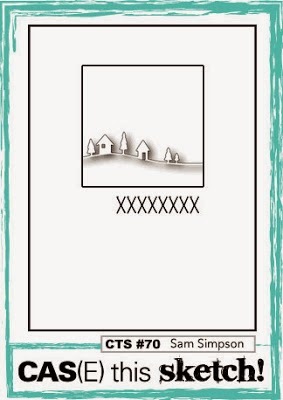 This was a card that was inspired by a video by Theresa Momber on Stamp TV shown here. I just had to make this card and followed her step by step directions but with different stamps. I was pleased with my results. I cannot wait for the spring bulbs to bloom....only have a few crocus opened. 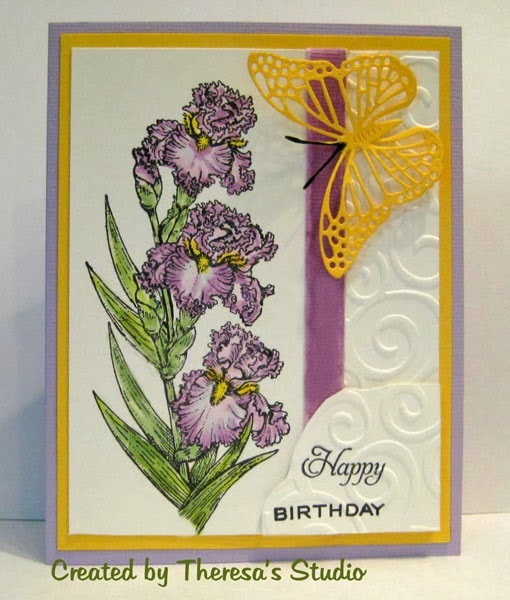 I made this card for some recent challenges using Butterfly and Daffodil stamps from Repeat Impressions. I colored with Copics and used oval dies to cut the images, I stamped the butterfly twice and cut one out and added to the top of the stamped one with pop up dots. The background of the image was lightly sponged with blue and the green mat was embossed. Clear It Out Challenge: Color challenge is Greens. Theme Green: Stash Use anything green. Used Green CS and Green Copics. Where is Spring? What is Mother Nature thinking? We have more snow and temperatures in the teens this morning! 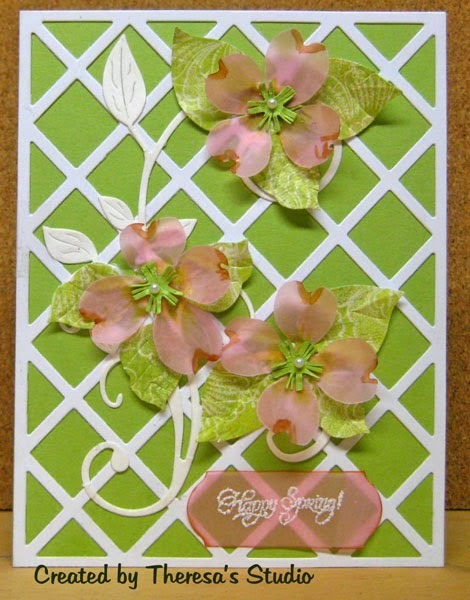 Well, at least we can think of spring which is what I was thinking about when I made this card using Dogwood Blossoms of Vellum placed on a white lattice celebrating the coming of Spring. Rita, this card is for you. 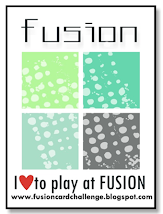 Thanks for the use of the Lattice die. Good morning! The project that I am sharing today is something other than a card. 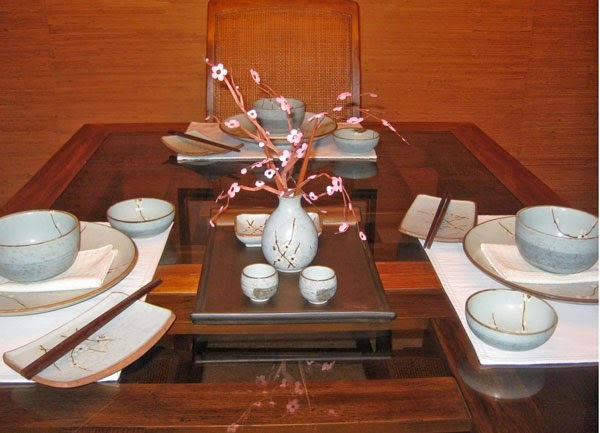 I needed a spring look for my dining table to go with my "Cherry Blossom" dinnerware. I decided to create something inexpensively with paper using the Cameo to cut a centerpiece to use in a Saki bottle. 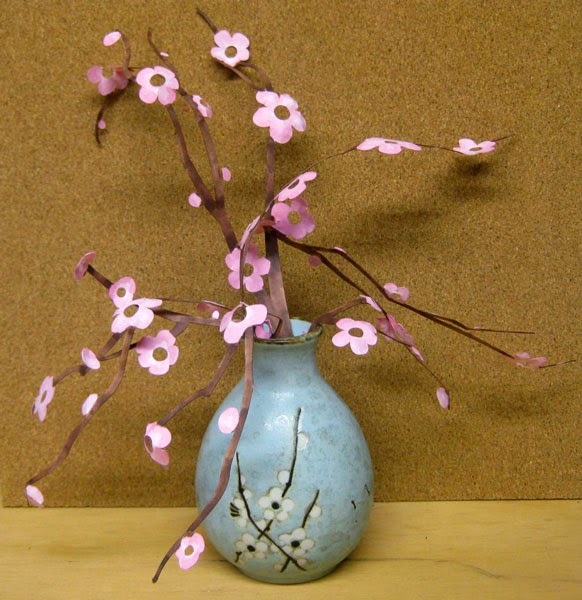 I simply cut 2 Cherry Blossom branches from 2 12"x12" white card stock and colored with Copics E27 and R81 on both sides of the cut outs. I arranged these in the Saki bottle ....paper was just the right weight to arrange easily. Design from Silhouette Store is ID#53579 by Hero Arts. See my table setting in the bottom photo. Ready for an Asian dinner. I plan to get back to card making and blogging on a regular schedule now that we are back home from our stay in Florida. Still waiting for Spring to arrive.....more snow last night and only 14 degrees this morning. 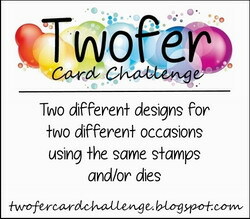 My post today is a Clean and Simple card for the challenge at CAS-ual Friday to use 2 or more shades of gray. I started with a dark gray card base and stamped a sentiment from GKD Stippled Nature Set in Memento Gray Flannel ink. 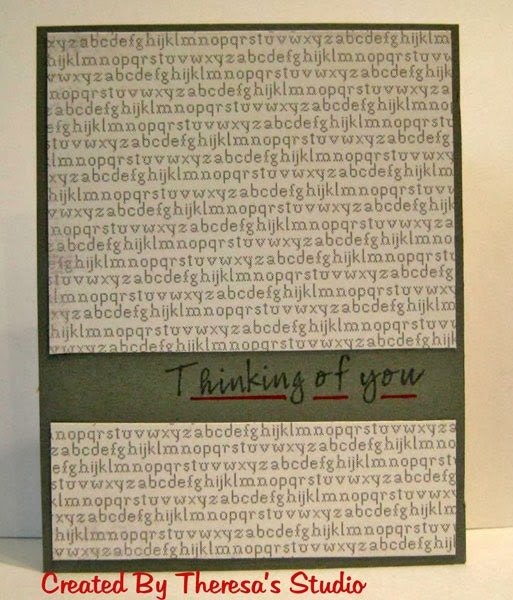 I attached 2 pieces of pattern paper in 2 shades of gray from MMY Quilting Bee Paper Pad above and below the sentiment. Finished with a touch of red with a Memento Lady Bug marker. How simple can this be?? 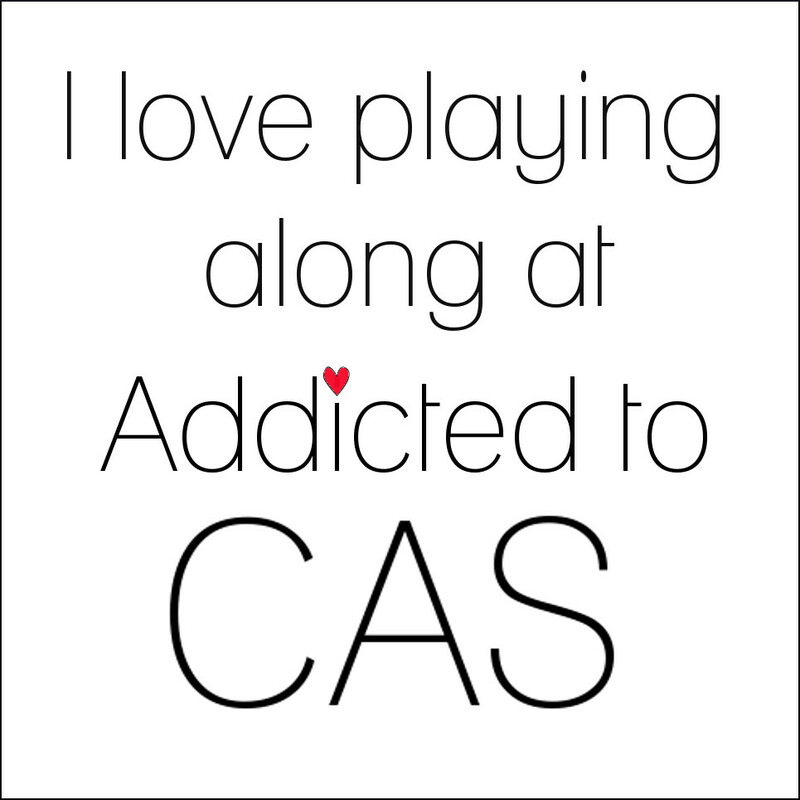 CAS-ual Friday: Shades of Gray-see graphic lower left. Hello and welcome! 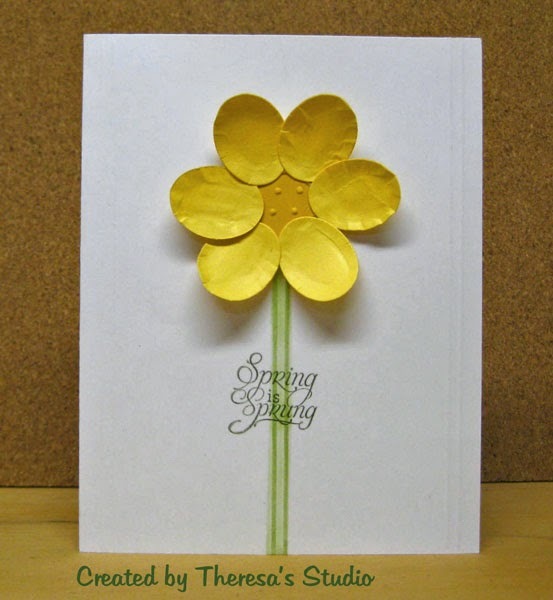 Today I am sharing a card made for a March birthday with a spring theme. 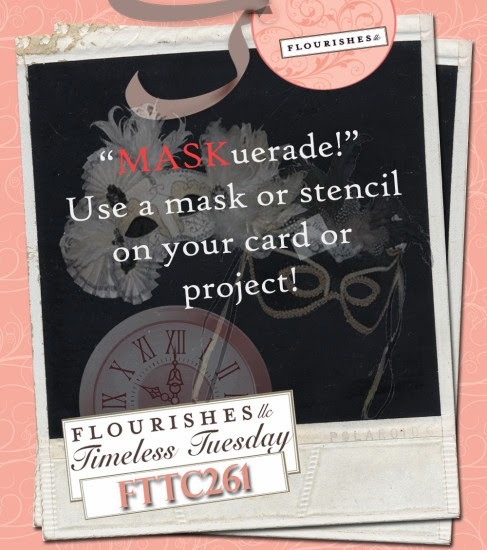 The stamps that I used are from Flourishes Flowers for Jan and Taglines. I stamped the Iris with Memento Tuxedo Black on white GKD cardstock and then using a mask, I stamped the Iris again to extend the flowers to the top of the card. I colored the image with Copics V000,12,15, G20,21,Y02. I embossed the right side with Cuttlebug EF Divine Swirls and added ribbon colored with Copics. 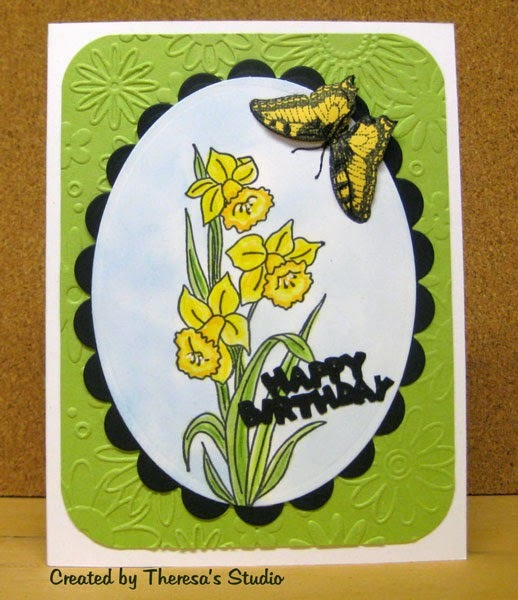 Added a Yellow butterfly cut with Cheery Lynn Die. 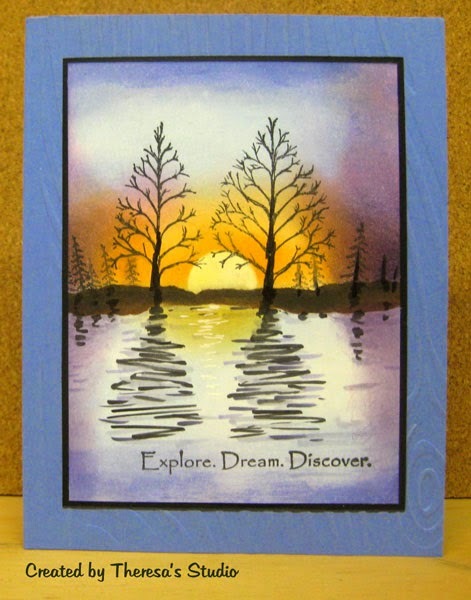 The image was attached to a yellow mat and then to the a card base of Bazzil lavender cardstock. Lavender Iris are a favorite of mine. Oldie but a Goodie: Spring has sprung. 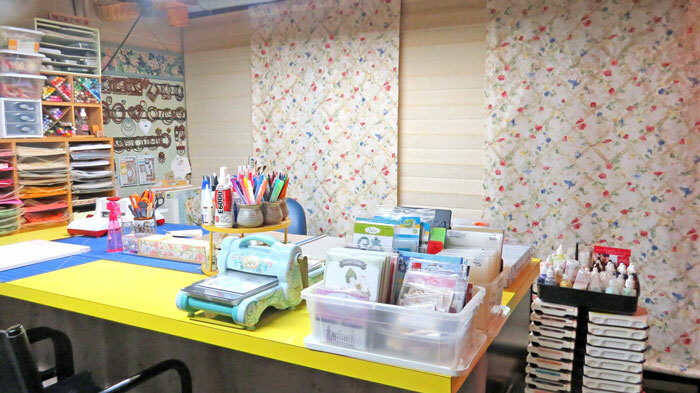 The sentiment stamp, ribbon, die and papers are all over 6 months old. Welcome! 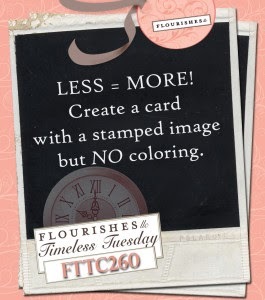 The challenge at Flourishes Timeless Tuesday is to use a stamped image but no coloring. Less is More! This was a bit difficult for me because I love coloring. 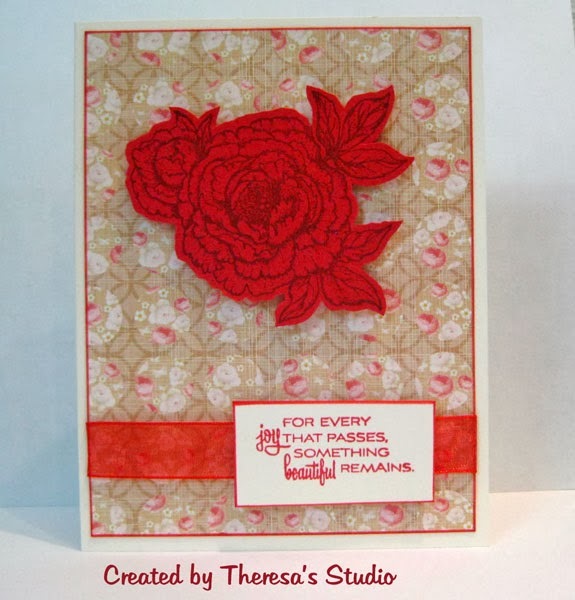 The card that I came up with was to stamp the Rose image from Flourishes "Flowers for Jan" on red cardstock with Memento Rich Cocoa ink and fussy cut the image. If I were home, I would have used my Cameo for cutting. I layered the image on patterned paper from Webster's Pages that I edged with red ink. Added a red organdy ribbon and sentiment using the same stamp set and Memento Red Ink. Attached to GKD Ivory cardstock base.